Do your body good and do the world good — now that’s a winning combo. Plant milk is a good, sustainable alternative to dairy milk. It safely provides your body key nutrients and minerals, giving you the strength and endurance that will allow you live your life to the fullest. By avoiding dairy milk, you help eliminate cruelty to animals and massively decrease global warming. On August 22, celebrate National World Plant Milk Day and raise a glass toasting to the health of both yourself and the world we live in. Almond Milk filed a class action lawsuit against two American competitors, Blue Diamond Growers and White Wave Foods, for false advertising on the product label about the small amount of almonds — the case was thrown out. Almond milk surpassed soy milk as the most popular plant-based milk in the U.S.
Almond milk sales increased by 79% in 2011 alone. The FDA ruled that 25 grams of soy protein a day could reduce cholesterol and the risk of heart disease. Horticulturalists discover that coconut milk can help other plants grow. With the range of dairy free products continuing to grow, it has never been easier to integrate plant milk into your diet. Try buying multiple flavors and seeing which ones are your favorite! Incorporate the “plant milk theme” of personal and global health into other dairy products, such as cheese. With countless recipes and cookbooks available, it’s easier than ever to make vegan cheese at home. Most recipes require only a few ingredients, and it’s doable to make everything from soft, spreadable cheeses, to harder, aged varieties. Take time to recognize your own health and the beauty of the world you’re helping along the way in the easiest form – simply get out into the world, take a deep breathe of fresh air, and embrace the home that gives us so much. In the Middle Ages, almond milk was known in both the Islamic world and Christendom as a nut (the "fruit of a plant"), and is considered suitable for consumption during Lent. In 2015, Almond Milk engaged Blue Diamond and WhiteWave Foods' Silk, popular American competitors, in a class-action lawsuit alleging false advertising that mislead consumers into believing that the products contained more than the 2% almonds they actually contained. The judge denied the request for an injunction. 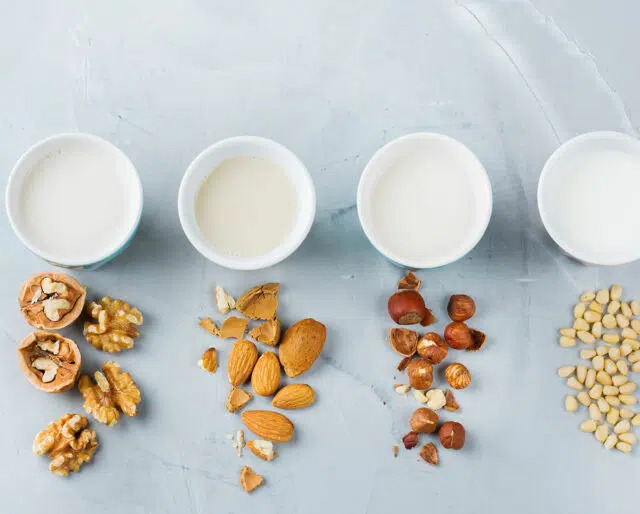 Despite its many health advantages, almond milk does not have as high a protein content as breast milk, cow’s milk, or hydrolyzed formulas, and therefore is not a suitable replacement for children under two years of age. The majority of American almonds are grown in the state of California. Cow milk is near-ubiquitous, but animal agriculture also leads to major pollution and greenhouse gas emissions. This drives climate change—meaning if we replace some of our cow milk with plant milk, we're doing our planet a great favor. Plant milk provides a long list of health benefits, including calcium, and a low sugar and calorie count. In addition, plant milk does not contain IFG-1 (a growth hormone given to cows) which has been linked to the growth of cancer cells. Plant milk comes in multiple options ranging from soy, almond, cashew, and rice, to oat, hemp, flax, and coconut. With an abundance of different tastes, you're sure to find one your tongue will love.